To filter the important information out from a flood of video images, ingenious analysis routines are required. 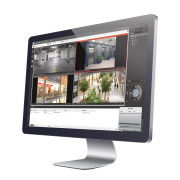 Using individually definable detection rules, SeeTec video analysis automatically directs the view to relevant events. This helps security personnel to detect situations quickly, determine possible hazard situations promptly – and draw the correct conclusions. The SeeTec LPR module is an add-on module for SeeTec Cayuga for the automatic recognition of license plates in stationary and moving traffic. It can read international license plate formats, including even with Arabic and Cyrillic characters, on up to 8 lanes per server.